Garden Planting – Stop Planting By Hand! When we were kids, I can remember doing our vegetable garden planting by hand. It was a group effort. My dad would use the handle of a hoe to punch a hole in the dirt and the kids would come behind him and drop seed in the hole. Mom would then come behind us with her hoe and she would cover and pack the dirt over the seeds. And while we grew many great gardens this way, it’s definitely not the most efficient way to plant a vegetable garden. Although dad was pretty good at punching holes in the dirt with his hoe, there was no true way of getting all of those seeds planted at the same depth. And although mom was also pretty good at covering up the seeds, there was no way to ensure all were equally covered. To obtain a well-germinated, quality stand of any particular crop, it’s important to plant all seeds equidistant from one another and to plant all seeds at the same depth. This is why a mechanical Garden Seeder is the essential garden planting tool for even the smallest vegetable gardens. Not only will it save you a great amount of time, it will also save a ton of energy and your back! A Garden Seeder allows you to plant all seeds in a row equidistant (for whatever seed spacing you choose) from one another and it allows you to plant all those seeds at the same depth with the same amount of compaction and soil coverage. This consistency in your garden planting can be the difference between a mediocre stand and a remarkable stand of vegetables in your garden. For garden planting staples like corn and beans, the versatility of the Hoss Garden Seeder makes it a “must-have” tool! The ability to customize seed spacing and hole size is most important for crops like corn and beans. Corn and beans have by far the most variance in seed size between different varieties than any other crops. Because the seed sizes are different among each variety, you’re going to need a different seed plate with a customized seed hole size for each variety. Also, everyone has a different preferred seed spacing for corn and beans. Because we use drip irrigation, we’re able to plant our corn much closer together on about 3 1/8″ spacing. However, most people plant on 4″ – 6″ spacing. So there needs to be a simple solution to accommodate all of these requests. 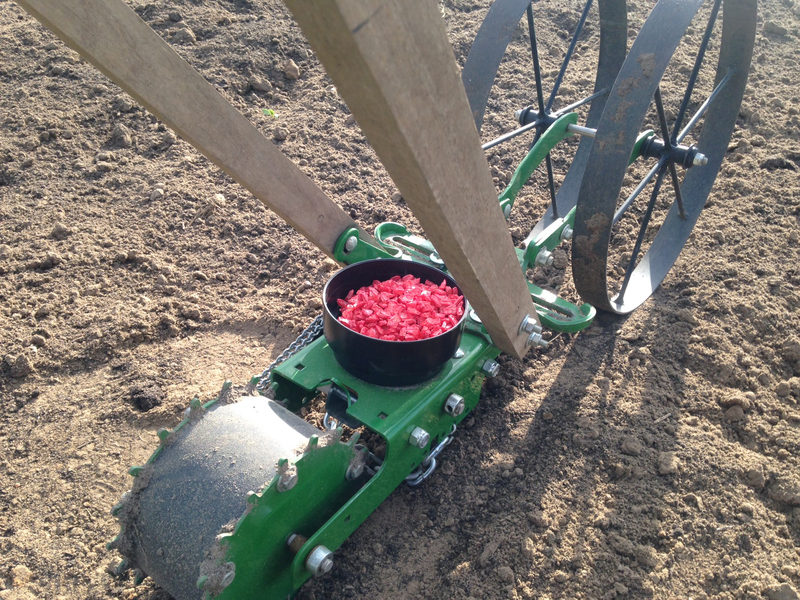 Our innovative Seed Plate design makes this really easy. With a simple drill and a step-drill bit, you can easily customize the size of the holes in the seed plates. It’s important to drill the holes large enough so that the seed lays comfortably flat in the hole without touching any of the sides of the hole. This will ensure that seeds will feed through the holes easily during garden planting. Seed spacing is also really easy. Simply divide 19″ by the number of holes in the seed plate to calculate seed spacing. To plant seeds closer together, drill more holes in the plate. To plant seeds farther apart, cover up the bottom of existing holes with tape. It doesn’t get any easier than that!